I CASEd this layout from BH&G Scrapbooks Etc. 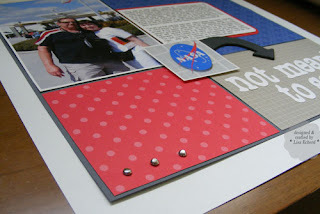 June Issue's Made in Minutes. It was made in minutes though minutes scattered over about 4 days :-) When you are really busy, it is especially nice to sneak in a little crafting time. 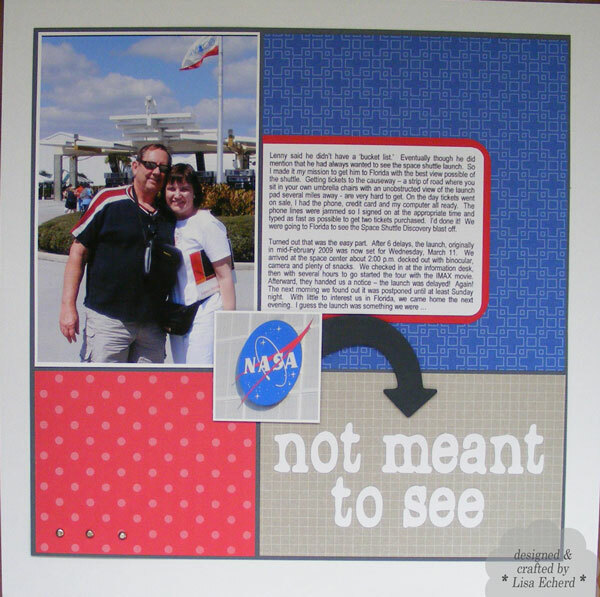 The layout is about our efforts to see a space shuttle launch - one of my hubby's wishes. After snagging very hard to get tickets, I thought the tough part was over. Unfortunately, this particularly launch was delayed 8 times. For 6 tries, we just kept postponing our trip. On the 7th, we and NASA were sure it was going to launch only to have it scrubbed just a few hours before lift off. We finally just had to come home. They launched about 4 days later. So I guess it was something we weren't meant to see. With no DSP in patriotic colors, I colorblocked the layout with papers from two of SU! 's 6x6 packs (highly recommended as a hostess option) and one tone on tone paper from another paper pack in Brilliant Blue. I love undressed chipboard like this curved arrow so I can paint or ink in whatever color needed. The dark gray color was just black and white paints mixed. Ingredients: DSP: Real Red, Sahara Sand, Jersey Shore by SU! Sorry you didn't get to see the launch.